Gleb Ivanov has had the best of two worlds in his young life. But last night at BargeMusic, he chose his Russian heritage to demonstrate his skill. A protégé of Mstislav Rostropovich, a piano soloist with the great Russia orchestras, he won the American Young Concert Artist International Auditions, moved to America, and has made his mark. Not only in New York but throughout the United States, playing at large and small concert halls. Unlike other Russian artists his age, he shirks from flamboyance, and gets down to work. Even when an audience doesn’t applaud on schedule (the Prokofiev First Sonata is such a one-movement rarity that apparently nobody in BargeMusic had previously heard it), he shrugged it off and went into a pretty dazzling Seventh Sonata. BargeMusic is kind of second home for Ivanov and Prokofiev. Previously he had played all the “War Sonatas” in one go. Next Friday at 7pm, he’ll be finishing the complete Prokofiev cycle with the Third, Eighth and Ninth Piano Sonatas. Last night, Mr. Ivanov played Prokofiev’s that strange Opus 1, then the jocular Second Sonata and finished with perhaps his most popular work, the Seventh. Whether one can compare him to, say, the transcendent Richter or Gilels performances at this point is a dangerous equivalence. But with his skill, his sensitivity, and with a sense of humor when necessary, Mr. Ivanov enlightened the audience with three very different faces of the great Russian composer. He didn’t begin with the First Sonata for good reason. Yes, it sounds like Prokofiev at time. But this was written when the composer was studying at the Moscow Conservatory, and one noted virtually all of his real and spiritual mentors. At times, one heard some ravishing Rachmaninoff melodic sequences, once in the middle of the movement, we heard Tchaikovsky, and the whole work breathed early Scriabin, along with Prokofiev’s own signature chords. Mr. Ivanov didn’t shrink from the romance of the piece. Like the composer, he actually enjoyed those romantic melodies, yet never exaggerated the difficult runs, he never paused romantic style, but allowed those tunes and those endless left-hand triplets to do their work. It’s a derivative work, yet not unenjoyable. The Second Sonata was not only enjoyable but joyous. And Mr. Ivanov played it that way. For the second movement, his left hand jumped over the right hand with such alacrity, one wanted to slap that hand, and say, “Now just stay at the bottom of the keyboard, which is where God made you”. Mr. Ivanov thankfully didn’t hear me, and he let the spiky music roll along. Nor did he seek to allay the schizophrenic opening movement or the legerdemain of the finale. I kinda wish he’d been a bit more introspective in the Andante, but perhaps with three movements so barbed and joyous from the young composer, a more literal slow movement was not out of place. The Seventh Sonata was neither the student Prokofiev or the joyous Prokofiev. This is the work with which the great pianists make their mark. The second of the “War Sonatas”, it shows a composer letting out all the stops, and letting any great pianist make what they will with his razor-cuts. Mr. Ivanov has the technique to let himself go wild, but he never did. One was impressed with his nervous, quick first movement. The opening was harsh, cutting, but somehow it lacked that jeering voice, that mocking tone which, say, Pollini augments his crazily sharp performance. Perhaps one needs the extremes to make way for the almost sentimental second movement. Or perhaps Mr. Ivanov’s literal unexaggerated playing was sufficient. Now, though, came the lodestone of Prokofiev piano movements. The Precipitato, in an aberrant 7/8 time, with its percussive repeated B-flat-C-sharp notes, as fierce as a German goose-step, driving the notes to a frantic finale. (One must compare this with Shostakovich’s ponderous repetitive goose-stepping theme in his own “Stalingrad” Symphony!) Mr. Ivanov let it go with hand-leaps, technically perfect, often biting, interrupted by momentary poignancy, but returning to the acerbic two-note cell. One inevitably looked out the window of BargeMusic (see picture above). The giant cenotaphs across the river, the rainy gray sky, the figures with umbrellas on the promenade like specters of death. Compared to this, Mr. Ivanov’s demonic fingers at times were like lightning flames. 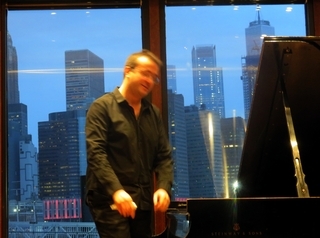 The concert was, yes, less than an hour, but the pianist kept each minute both articulate and acute.